6 June 2008, at 11:37a.m. UK - The Food Standards Agency (FSA) has today published research into the views of the UK public about cloning animals, and cloned animals, their offspring and their products (such as milk and eggs) entering the food chain. The Agency carried out the UK-wide research in advance of being asked by any company wanting authorisation to market food produced using cloned animals. The FSA is the UK body responsible for the assessment of these and other novel foods (these are foods that do not have a history of significant consumption within the European Union before May 1997). The key areas of concern that workshop participants expressed were whether food derived from clones would be safe to eat, standards of animal welfare, the lack of tangible consumer benefits, and a mistrust in the motives of the key players involved. A summary of findings is below. The full report can be found at the link towards the end of this page. 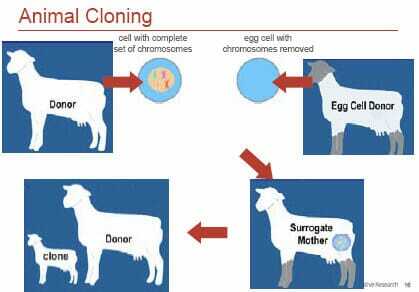 When considered in the context of current breeding practices, animal cloning was seen by participants to be very different from other Assisted Reproductive Technologies; it was felt to represent a leap from ‘giving mother nature a helping hand’ to ‘interfering with nature’. Participants struggled to identify any tangible consumer benefits and were concerned that the main motive would be a financial one to biotech companies, livestock breeders, farmers or food retailers. As participants learned about the current low efficiency rates of Somatic Cell Nuclear Transfer (SCNT) they became increasingly concerned about the impact the technique has on animal welfare. This became a significant factor behind their reluctance to accept food derived from cloned animals. Other ethical concerns raised were about where the technology is going and whether we, mankind, have the moral right to pursue such a course. Participants were concerned that cloning could result in food that was unsafe for human consumption; this was partly a function of the perceived high incidence of miscarriages, deformed and short-lived. They feared that the process of cloning might somehow create new diseases or affect the food in some way that will be harmful to humans and that the impact on human health and wellbeing may only become apparent at some unforeseen point in the future. There was a major mismatch between the methods used by regulatory authorities to assess food safety and the public’s perception of what is needed. Participants wanted to see methods for assessing food safety that were similar to the approach used in clinical drugs trials. If food derived from clones and their offspring were to go on sale in the UK, the research provides a clear steer in terms of what would provide consumer confidence. Regulations should be in place that address the entire process, these should be monitored and enforced and should be fully transparent to the consumer. Clones and their offspring should be fully traceable throughout the food chain and food should be labelled to enable consumers to make an informed choice. There was a call for a programme of continuing independent research to improve the efficiency of the cloning process and to prove that food derived from clones is safe to eat. The Agency (possibly in partnership with other bodies) was seen by most as having a key role to play, both in terms of setting and policing the rules and in informing and educating the public and therefore allowing them to make informed choices. Whatever the Agency’s role, it is crucial that it is perceived to be independent and trustworthy. Animal cloning is an emerging technology in the EU and is more developed in the United States. If its use becomes economically possible, there is the potential for food produced from cloned animals to enter the food chain. Although there has been some research among US public, to date there has been very little within the EU or the UK. The Agency commissioned the company Creative Research to explore initial public perceptions of animal cloning. The Agency recognises that animal cloning is likely to trigger consumer concerns about food safety, animal welfare and ethics and the findings from this research will enable the views of the UK public to be reflected in any EU discussions about the use of the technology. - You can view the full report, Animal Cloning and Implications for the Food Chain, by clicking here.